The usual path out of this impasse is to rank order the initiatives. But rank ordering runs into some fundamental conflicts. For one thing, it puts team members in the untenable position of either lobbing grenades into another team member’s territory or defending their own area’s initiatives from challenge. Furthermore, team members who agree to the cancellation of an initiative in their area will have to justify the loss to their people. And more powerful team members may be able to protect their initiatives regardless of merit. Attempting to overcome such barriers, some organizations use initiative weighting and scoring systems. Criteria such as business value, confidence to deliver, risk, and so on are established and weighted. Each initiative is then assigned points for how well it fulfills each criterion. Finally, each initiative’s points are multiplied by the weight of the criteria it helps fulfill. These calculations ultimately generate a mathematically determined rank order for each initiative. Weighted systems do get several things right. For example, criteria make explicit what the organization is trying to optimize. Initiatives are evaluated relative to each other, rather than inisolation. And deferring the question of which initiatives will be funded makes the process easier. We start by selecting what we believe to be one of the most important initiatives from the must do/now cell. Then we initiate a discussion focused solely on this initiative’s importance. (does the company have to do it?) For the time being, we leave aside the question of urgency. Usually, the group readily agrees that the initiative is important, so it can be transferred to a second, empty wall chart. From the original group of must do/now, a second initiative is selected, and the group is asked to discuss its importance relative to the importance of the prior initiative. There is no discussion of the second initiative’s intrinsic merits, and the question of funding is not on the table. (determining relative funding levels is the CEO’s prerogative, of course, and he or she will make the call later.) This is where such discussions really take off. Why? The group works to answer one—and only one—question: Is the second initiative more important or less important than the first one we discussed? We then follow the same procedure to determine urgency. From the top quartile of importance, we pull an initiative and transfer it to an empty wall chart. We’ve already agreed that the initiative is something the company has to do, but we haven’t agreed as to when. So we pull another initiative from the top quartile and consider when (in relation to the initiative already on the chart) the second initiative should be done— sooner or later. Then we take a third initiative, and so on. We do this until the initiatives now arrayed horizontally begin to form clusters by urgency, just as they did by importance. Typically, we work through the first three importance quartiles, which correspond roughly to must do/should do/nice to do. And we end up with those initiatives distributed according to urgency: now, soon, later. We can then place the initiatives in the nine-cell matrix, as in Figure 1. 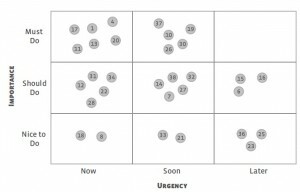 This matrix provides a strong visual representation of the importance and timing of initiatives simultaneously. its most productive and rewarding. The prioritization discussion determines which initiatives are important and how urgent they are. The integration discussion, presented below, tests whether the initiatives are focused in a way that will provide the maximum contribution to the organization’s major strategic objectives. To start the integration discussion, large sheets of paper with images of archery-style targets are placed on the wall. Each has an inner ring—the bull’s eye—and two additional concentric rings. The top of each sheet is labeled with one of the company’s major strategic objectives. Increase gross margins by 14%. Improve customer satisfaction to 95%. Increase unit share of our core market by 10%. Cut cycle time for new product introductions by 40 days. The SMT opened the discussion by choosing an initiative from the prereading: “Create a council of critical customers to meet directly with product engineering during early stage of product development.” The group then discussed which of the four critical targets the initiative helps achieve and how close to the center to place it: bull’s eye, second ring, or outer ring. Proximity to the center depended on whether the initiative directly drove the desired outcome (bull’s eye), had a close relationship but wasn’t aimed directly at the outcome (second ring), or had a tangential role (outer ring). Team members agreed that a council of critical customers would certainly boost customer satisfaction because products would be more closely tuned to customer needs when introduced. But they also concurred that the initiative, designed specifically to make the most important customers happier, might not affect the broader base of customers who used the company’s products in a wide array of applications. So a yellow sticky note with the initiative title was placed on the second ring of the customer satisfaction target. Most initiatives end up somewhere on one or more of the targets. Sometimes, however, an initiative doesn’t hit any ring on any of the targets and ends up on a flip chart. The initiative may be important and will be pursued, but it might not significantly affect the outcome on any strategic objective. It also raises a flag that the initiative does not contribute meaningfully to company strategic objectives and might be considered for elimination or deferral. The “aha” moment occurs after all of the sticky notes have been distributed among the targets. That’s when the team can step back and visually survey the extent to which the entire portfolio of initiatives is linked to the company’s strategic objectives and themes. What if an objective has no initiatives assigned to it? In such cases, there are two possibilities: The team is assuming that the company will achieve it through business as usual, or it is clear that the team needs to devise initiatives to put behind the objective. An objective with several initiatives in the second and third rings but none in the bull’s eye may indicate that the company needs to aim its initiatives more accurately. Or the team may find several related initiatives that could be consolidated, reoriented, or better coordinated for higher impact.